Stan Corcoran's TG-1A (Training Glider Model 1A) was the first aircraft selected to train U.S. Army glider pilot cadets to fly the Waco CG-4A combat assualt glider. The Waco could be difficult to handle with heavy loads, and a skilled pilot was required to fly it. Until late in the war, Wacos were only produced in limited numbers, and none were available for training. Before bidding on producing the TG-1A, Stan Corcoran had produced gliders for the civilian market at his Frankfort Sailplane Company factory. In May 1942, the firm won a contract to build 40 TG-1As. Production began immediately, and the order was completed by November 1942. Each glider cost $2,775 to build but Corcoran's factory lacked the resources to quickly produce large numbers of gliders. The Schweizer Aircraft Corporation easily built many more TG-2 gliders, a design similar to the TG-1A. By war's end, nearly 1,100 dedicated military training gliders were completed. Military gliders came into use during World War II as a means to leapfrog natural and man-made barriers and deliver combat troops and equipment deep into enemy territory. Troops that deployed in gliders tended to reach the ground in a more concentrated group than airborne troops that jumped from cargo airplanes wearing parachutes. Soldiers scattered across a wide area could not concentrate their firepower and were difficult or impossible to communicate with, and these limitations greatly reduced their combat effectiveness. Gliders could also carry light artillery or small vehicles directly into a landing zone to support paratroops (soldiers deployed by parachute) or glider-borne infantry. The primary U. S. Army combat glider was the Waco CG-4A. This glider could be difficult to handle with heavy loads and a skilled pilot was required to fly it. Until late in the war, it was only produced in limited numbers and none were available for training. To train army cadets to handle the big Waco, the army urgently needed a training glider that was easy to build and handled well in the air. The first aircraft selected for this role was a glider designed by Stan Corcoran, the TG-1A (Training Glider model 1A). U.S. Army planners realized the potential of a glider-borne assault force after German commandos, aboard DFS 230 gliders, landed atop and captured the Belgian fort of Eben Emael in May 1940. The American army began to develop programs to design and build assault gliders, and train crews to fly them. But American industry was under tremendous pressure to expand production, and create and field new weapons. The national military leadership was forced to assign priorities and they ranked gliders well behind fighters and bombers. Henry H. "Hap" Arnold, commanding general of the Army Air Forces (AAF), declared that glider contracts could be awarded only to civilian manufacturing firms not already committed to military aircraft production. The AAF contacted eleven companies and invited them to submit glider designs for 2-, 8-, and 15-man gliders in March 1941, but only four returned bids: Bowlus Sailplanes, Inc, St. Louis Aircraft Corporation, Waco Aircraft Company, and the Frankfort Sailplane Company. Before submitting his bid, Stan Corcoran had produced gliders for the civilian market at his Frankfort Sailplane Company factory. He was well known among competition glider pilots, and in the late 1930s, he had started small-scale construction of his Cinema I single-place glider in Frankfort, Michigan. Civilian interest in gliding was growing at a steady pace and Corcoran's company soon relocated to larger facilities in Joilet, Illinois. When the request for military gliders came out, Corcoran responded with a two-place training glider design, essentially a Cinema I with provision for another pilot. Corcoran also attempted to win contracts for production of the 8- and 15-man cargo gliders. However, during tests, Corcoran's prototype, 8-seat cargo glider, the XCG-1, suffered structural failure at only 63% of its design load strength, and Corcoran was advised to stick to designing light training gliders. On May 26, 1941, the Frankfort Sailplane Company received a $5,784 contract from the AAF for three prototypes of a two-place glider designated XTG-1. This was the first contract issued for a U. S. training glider. The new design, soon to be called the Cinema II or Corcoran Model B, consisted of an additional tandem seat in a stretched cockpit. Other changes included a fixed horizontal stabilizer and elevator in place of the all-moving stabilator on the Cinema I. Stall speed was only 59 km/h (36 mph) and the never- exceed speed was calculated at 130 km/h (80 mph). Corcoran welded together pieces of steel tubing to form the TG-1A fuselage and wings and covered them with cotton fabric. He constructed the horizontal and vertical stabilizers from wood, and he installed plywood spoilers on the upper wing surface. The pilot could increase the glider's rate-of-descent by approximately .8 m/s, or 150 fpm, using the spoilers. The tandem cockpit consisted of two canvas seats equipped with dual flight controls and instrumentation, and covered by a multi-pane, plexiglass canopy. A hinged section of the canopy gave access to the front seat, a small, quick-release door on the right side of the fuselage allowed access to the rear seat. Instrumentation consisted of an airspeed indicator, altimeter, rate-of-climb indicator, turn and bank indicator, and compass, duplicated for both front and rear seats. A single radio was included in the front-seat position. Landing gear consisted of a single wheel and tire (fitted with a brake) installed on the bottom of the fuselage, behind the leading edge of the wing, and a wooden skid with rubber shock absorbers placed in front of the wheel. A small tailskid protected the fragile rudder and vertical stabilizer during ground handling. In May 1942, the Frankfort Sailplane Company received a contract to build 40 TG-1As. Production began immediately and the order was completed by November 1942. Each glider cost $2,775 to build but Corcoran's factory lacked the resources to quickly produce large numbers of gliders. The Schweizer Aircraft Corporation easily built many more TG-2 gliders, a design similar to the TG-1A. By war's end, nearly 1,100 dedicated military training gliders were completed. The expense and casualties involved in the U. S. combat glider program during World War II raise questions about its ultimate value. Operations in Europe achieved mixed results and heavy casualties. However, in Burma, combat gliders proved very useful in placing troops and equipment behind Japanese lines. After the war, the glider force was abandoned and eventually replaced by the more versatile and cost-effective helicopter. All training gliders, such as the TG-1A, were declared surplus and offered for sale to the public. Sport gliding resurged when these cheap gliders flooded the market but this also forced most glider manufacturers, including Corcoran, into serious financial difficulty. More than thirty years after combat glider pilots trained in it, Stan Corcoran donated a TG-1A to Lewis University in Illinois. An aircraft structures class at the University fully restored the aircraft and test flew it as a class project. Lewis University donated it to the Smithsonian Institution in 1983. 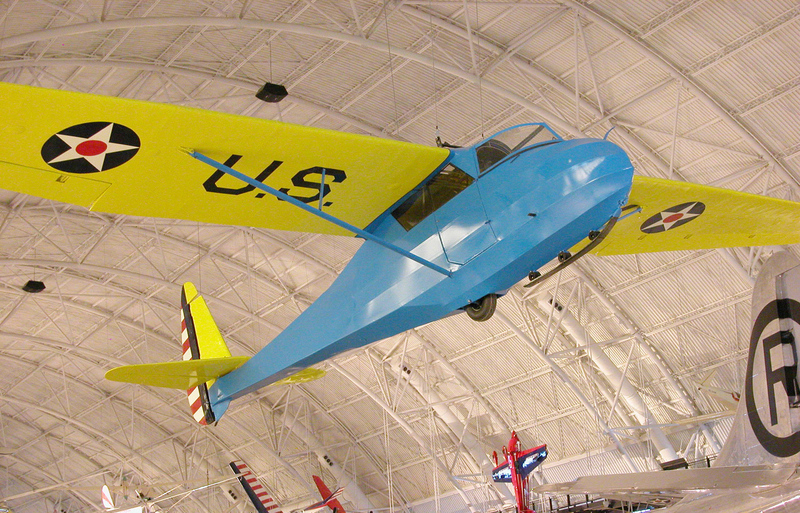 The glider is painted in the blue and yellow colors specified for training aircraft during World War II. Gift of Lewis University, Romeoville, Illinois.